RHA TrueConnect: £150 true wireless buds with 25-hour battery life | What Hi-Fi? RHA has announced its first pair of first true wireless earbuds, the TrueConnect. 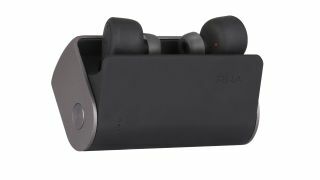 With a pretty different feature set (and price tag) from the high-end planar magnetic wireless in-ears that RHA recently announced, the £150 TrueConnects boast an IPX5 rating – meaning they should survive if caught in a rain shower – as well as a 25-hour battery life. Those familiar with true wireless earbuds won’t be surprised to discover 20 of those hours are provided by the supplied charging case, with the buds’ battery life a fairly typical five hours. The case offers four lots of four-hour charge to the buds, so RHA claims that you can get 25 hours of wireless playback on-the-go before case needs re-charging. A complete case charge (via UBS-C) takes one hour and forty minutes, while fast charging offers 50 per cent battery life in 15 minutes. Buttons on the buds’ housings are for controlling music playback and launching the connected device’s voice assistant. It’s a decent spec sheet, but to hold our attention they’re going to have to prove worthy competition for the current class-leading Sony WF-1000X. We look forward to finding out if they do. The RHA TrueConnect buds are available to pre-order online today from £149.95, with the availability date the 18th October.